Designed for the serious and recreational badminton, squash, racquetball and tennis player who want a dynamic look, ultra comfort and proven performance. Reaching new heights in complete foot support, comfort & performance for court footwear. ASHAWAY AMPS 300 & 500 series is a lightweight shoe built for speed that also provides total foot support & comfort. AMPS Zz cushion insert 300 series - Maximum rebound,cushioning and comfort cushion inserted into the heel. 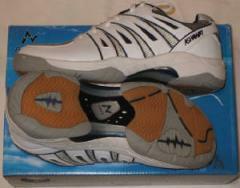 500 series - Incredibly high rebound and cushioning insert in the front & high shock absorption in the heel. 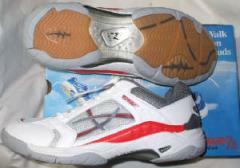 Midsole EVA 300 series - 25% Lighter than normal EVA. 500 series - Super light EVA, reduces weight of EVA by a further 30% even after increasing thickness by 3mm. Anatomic Stability & Cushioning System 500 series only. Added TPU & Zz cushion insert into heel, plus an extra lateral support for increased stability & comfort.